Holiday shopping can be so much fun. Thinking of and finding the perfect gift makes you feel great, and seeing the recipient open it up and get excited is the icing on the cake. Homemade gift baskets are a way to show off your creativity and style and give your friend or family member several gifts related to a unique theme. What better theme is there than cats? After all, people love spoiling their feline friends. 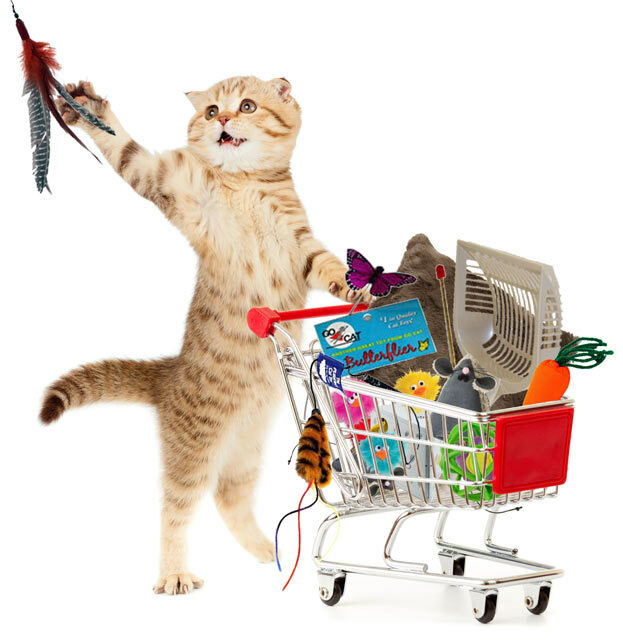 Make some cat gift baskets quickly and easily, and hand them out to all of the cat owners on your list. Don't forget to make some for your own cats, too. Here's one great way to construct a gift basket for a cat, where even the basket and lining is part of the gift. Cat Caves are the ultimate in coziness for a cat. Cats love to climb in, hide, curl up and sleep, and simply watch what's going on from the safety of a cave. They come in a variety of beautiful colors, including some classic holiday ones, so just choose the one you like to be the basket part of your gift basket. Instead of tissue paper, line your kitty gift basket with a Muffin Blanket. They are so soft, and cats absolutely love kneading them, lying on them, and curling up in them. Pick one that complements the cat cave you've chosen, and line the cave with it. Kris Krinkle Catnip Tree Toy: stuffed with strong catnip, made in the USA, and adorable, you and your kitty will both love to play with this tree. 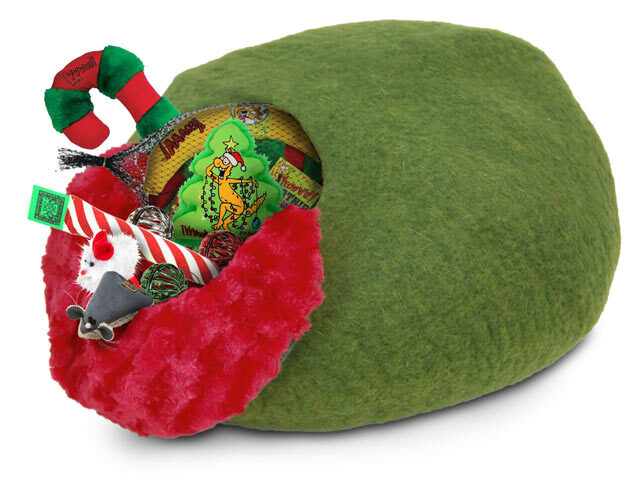 Stocking: keep your kitty busy with a cat-friendly, catnip-stuffed stocking on Christmas morning. Candy Cane: cats don't like real candy canes but yours will love this one and this one because it has potent catnip inside. Holiday Field Mouse: welcome this cute mouse into your home for the holidays, and delight your cat at the same time. Jolly Jingle Balls: your cat batting around these colorful jingle bells around will keep your holiday home sounding cheerful. 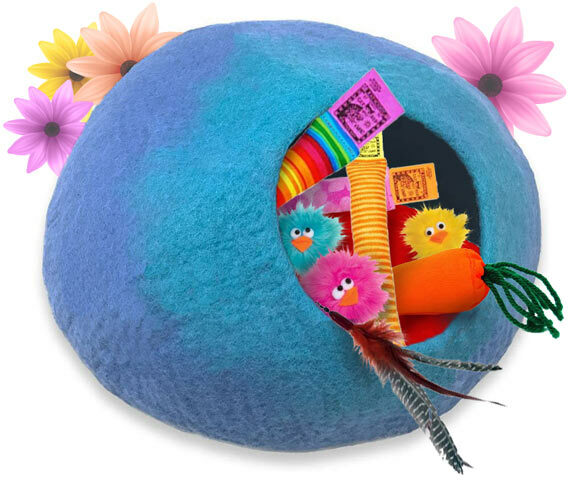 Kris Krinkle Holiday Gift Bundle: this bundle is stuffed full of fun toys that all have catnip in them, are made in the USA, and are delightfully cute. You'll be the hit of the holiday season in your circle of cat-loving friends and family when you give these homemade gift baskets away. Your own cat will think you're pretty cool, too, and we all know how hard it is to impress a cat.